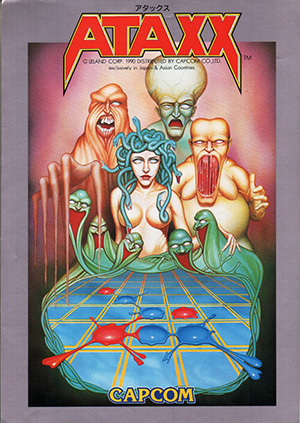 Ataxx is a board game that first appeared in 1990 as an arcade video game by The Leland Corporation. It also appeared in 1990 as the video game Spot and later as the Microscope Puzzle from the 1993 CD-ROM game The 7th Guest. The game was invented by Dave Crummack and Craig Galley in 1988 and was originally called Infection. It was first programmed on Amiga, Commodore 64 and Atari ST.